The Japanese beetle (Popillia japonica) causes widespread destruction on garden plants, especially roses, throughout the eastern United States but can be controlled with moderate persistence. The beetles grow as grubs in lawns and turf grasses. They quickly spread as beetles to garden plants. More than 300 plant varieties are susceptible to the Japanese beetle, but one of their favorites is the rose bush. A rose bush under siege by the Japanese beetle will quickly lose its flowers and leaves, so killing the infestation early is paramount to the rose bush's health. Pluck Japanese beetles by hand and submerge them in soapy water. Mix the water with 25 percent dish soap and 75 percent water. Beetles should never be allowed to accumulate on a rose bush because the beetles' presence will quickly draw in other beetles and the infestation will become severe. If you see several beetles on the rose bush, simply hold the pan of soapy water under the plant and gently shake the rose bush so the beetles fall into the soapy water to drown. 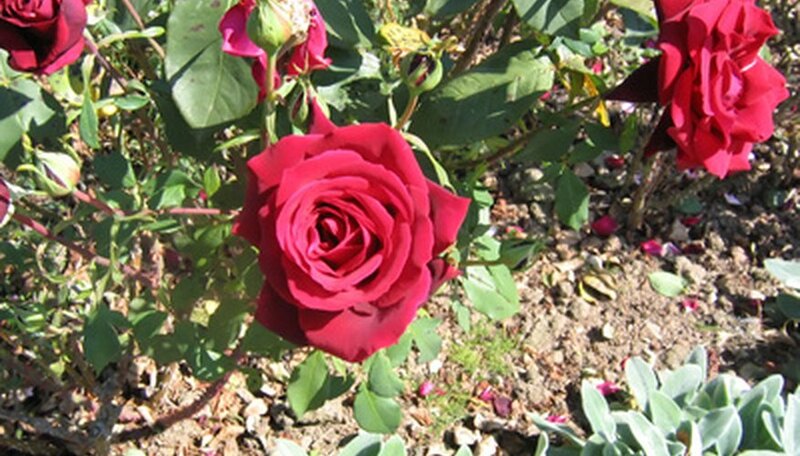 Spray the rose bushes using Neem oil. Neem oil is available at garden supply stores and many health food stores. It is an organic and safe oil that will repeal Japanese beetles for three to four days and then must be reapplied. Wash the rose bush using insecticidal soap specifically formulated for Japanese beetle infestations. Insecticidal soaps are available at many garden supply stores. The soap is applied to the plant and hosed off. It will give up to a week of protection against the Japanese beetle and is is far less toxic than many pesticides. Spray the rose bush, using a pyrethroid insecticide spray mixture. Cyfluthrin, deltamethrin, permethrin bifenthrin and esfenvalerate are pyrethroid-based insecticides sprays that control Japanese beetles for two to three weeks. Follow the directions on the label for application instructions. Most insecticides must be applied with a garden pump sprayer. Spray both the top and undersides of the foliage. Japanese beetle traps are widely sold to attract the beetles. Unfortunately, the University of Kentucky Entomology Department has conducted research that shows the traps attract far more beetles than they actually kill, which leaves plants more susceptible to a large infestation. What Is Eating My Knock Out Roses?